What a great and auspicious way to start off the new year 2015. His Eminence is one of the highest, most qualified and down to earth contemporary Vajrayana masters. We are so honoured to have Rinpoche visiting our centre from 3 - 4 January 2015.
and empowerments from a very special teacher. we have to charge this time to contribute towards the cost of bringing the master to our shore. Our final evening of entertainment, feasting and merriment was held in November 2014!! All funds raised went to Tibetan Refugees in India. We feasted on great vegetarian cuisine and were entertained by excellent Bollywood dancing and singing! A non residential retreat and the program held at KBI. Tantras is the special deity for removing the various types of obstacles that can arise during intensive practice. to the Hevajra called the Vajrapanjara Tantra. This was KBI's 13 Annual Vajrapani event. the auspicious 69th Birthday celebration of His Holiness Sakya Trizin, our patron and Root Guru. the life and imagination of an eight-year-old boy called Ishaan. Rinpoche led a Lojong (mind training) Retreat from 20 - 22 June. The retreat was held at Yerrinbool Bahai Learning Centre in the beautiful tranquil surroundings of the Southern Highlands. For a copy of the inspiring Lojong Retreat Booklet - including amazing verses on impermanence - please click here. Rinpoche's birthday was during the month of Vesak. We hosted a special celebration on 14 June. Please click here for more information. Cost $60pp, which all goes towards costs for running the event and supporting KBI. Refuge Ceremony, Precepts Ceremony, Bodhichitta Vows. The most significant day in the Buddhist Calendar is on the (full moon) 15th of the 4th Lunar month. It represents Buddha's Taming of the Maras, Enlightenment and Parinirvana. for the day, until the next sunrise (24 hours). Any actions performed on significant days like this gets multiplied by 1,000,000.
ways of compassionate wisdom of the Buddhas and start afresh. What better way to start the day with SOJONG. (no eggs and alcohol contents) after the completion of the ceremonies around 8am. Generosity, Ethics, Patience, Effort, Concentration and Wisdom. that is genuine, unconditional and lasting and eventually the highest bliss - the complete Enlightenment. Aenpo Kyabgon was one of the elite Dharma teachers to participate at the Mitra Conference 2014 and Rinpoche talked about the nature of MIND. This program was a series of Thursday night sessions designed to remind our bodies how to rest deeply in order to reinvigorate our natural aliveness. We forget the basics of wellbeing sometimes – how to stop and breathe deeply, how to rest down, how to unwind the knots of tension from the day. It’s so simple we forget to do it. But we can’t do our best work in the world without that dedication to the ongoing practice of embodying well-being. Led by Vasi Alvanos, a Somatic Psychotherapist and a Tibetan Buddhist practitioner who has studied with some fabulous teachers over the years, notably Robyn Speyer, (one of Australia’s most qualified Bio Dynamic Bodyworkers), Dr Julie Henderson (PhD) and Dr Tony Richardson (Somatic) Psychiatrist. KBI's resident teacher, Ven Loppon Ngawang Lekdup gave a DHARMA TALK on how to live a happier and more compassionate life. Loppon is a highly qualified Tibetan teacher living in Australia. He is fun. His teachings are helpful. Losar celebrations for the start of the year of the Wood Horse will take place on Sunday 2nd March 2014. KBI invites all members, friends and relatives to come and share in the festivities for ‘Tibetan (Lunar) New Year at our Centre on this day. There will be an early morning Tara Puja starting at 9.30am followed by meditation practice and a community lunch. Aenpo Kyabgon Rinpoche gave teachings on the techniques of basic calm abiding (shamatha) meditation. This was Rinpoche's last teaching for the year 2013. Next teaching will be in February 2014. Aenpo Kyabgon Rinpoche gave a talk on the essence of meditation. "Don't just sit there in one corner and pretend - Be out there and become one with the practice within". Kyegu Buddhist Institute sponsored and hosted Rinpoche's only visit to Australia in 2004. To commemorate His Eminence's birthday, we hosted a special dinner with friends - with music, entertainment, good food and great company. Aenpo Kyabgon Rinpoche gave an inspiring talk on building confidence and using our own ability to overcome adverse conditions and being happy. Aenpo Kyabgon Rinpoche gave a brief orientation on the unique Buddhist viewpoint of INTERDEPENDENT ORIGINATION. "Discover the beauty and connection within". reflecting on the kindness of one's mother and other close ones and how to love without attachment. This was the first discussion on compassion in a two-part series. Dates for the second event will be forthcoming. KBI's community thoroughly enjoyed the documentary 'Yogis Of Tibet'. one of the most common practices performed at all the monasteries and nunneries in Tibet. The community joined our Sangha to be part of this wonderful Puja. Aenpo Kyabgon Rinpoche gave a talk on "Living In The Teachings Of Buddha" in Coffs Harbour. "Life is precious and we must make use of the time and opportunity we have now to fully realise its potential." Aenpo Kyabgon Rinpoche also led a guided 'calm abiding meditation' session. KBI's community thoroughly enjoyed this beautiful Korean Buddhist film - SPRING, SUMMER, FALL, WINTER......SPRING. Please click here for synopsis and reviews. this Friday for an hour from 8-9pm. Aenpo Kyabgon Rinpoche: "Many of us have been very fortunate to have met His Holiness and received teachings directly from him. carry that blessing into their spiritual path." longevity and wellbeing on this special occasion. And of course a little cake ceremony after that. Aenpo Kyabgon Rinpoche led Kyegu Buddhist Institute's 12th annual Vajrapani retreat from 22 to 25 August 2013. This was a residential retreat, held in the beautiful Southern Highlands and organised by Palden Sakya Australia. dispelling of obstacles and to enhance the Vajrapani practice of the students who take Vajrapani as his/her path. profound practice of Vajrapani Bhutadamara. enlightenment – not to mention attaining the benefits of relief and freedom from temporary stresses and difficulties in our individual lives. The practice of Dharma, significantly, allows us to reflect upon the infinite sufferings of our once beloved mothered sentient beings. transformed into a higher irreversible state of joy and peace. Dzambala deities and so on. Aenpo Kyabgon Rinpoche bestowed Vajrapani Bhutadamara empowerment at 3:30pm on Saturday 3 August 2013. Amongst various Vajrapani deities, Vajrapani Bhutadamara belongs to Anutarayogatantra, the highest classification of tantra. their great compassion and Manjushri their transcendental wisdom. and Somatic Psychiatrist. Sue Robinson, Somatic psychotherapist, also taught alongside Tony on the weekend. The weekend workshop was about learning practices to develop stability and well-being and create support for spiritual practice and everyday living. Four Armed Chenrezig, Buddha of Compassion. Great Compassion is the root of Buddhadharma. Aenpo Kyabgon Rinpoche bestowed the empowerment of Four Armed Chenrezig, Buddha of Compassion on Saturday 13 July 2013. Great Compassion is the root of Buddhadharma. Mahakala Puja was performed to dispel obstacles and dedications were made for particular people in need. Many attended and participated. The Puja was led by Aenpo Kyabgon Rinpoche and the Sangha. Celebrations for the birthday of His Holiness the Dalai Lama and a long-life White Tara Puja was led by Aenpo Kyabgon Rinpoche and the Sangha. This was a great opportunity to celebrate the life of a great spiritual leader in modern times. Rinpoche gave a talk on the FOUR SEALS OF DHARMA, and explained how important it is for all of us in our practice as Buddhists. Understanding of the Four Seals enriches our perspectives of the world and most importantly enhance loving kindness, compassion and altruism. The event was held at the International Buddhist Cham Shan Temple of Australia, 85 Freemans Drive Morisset. For more info on Cham Shan Temple, please click here www.chamshan.org.au. Click here for teaching photos. fun and show the film KUNDUN as HH the Dalai Lama visits Sydney for a series of teachings, please click here for information. All proceeds went towards supporting KBI so as to allow us to continue to offer our teachings without a set charge but instead by donation. Click here for the movie night photos. 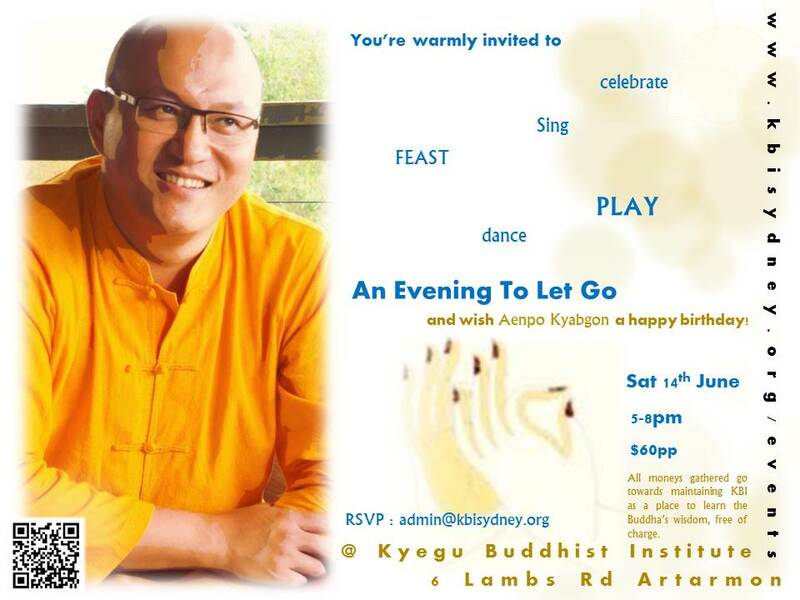 Aenpo Kyabgon Rinpoche led a weekend Lojong (mind-training) Retreat from 31 May to 2 June in the beautiful Southern Highlands. The retreat was truly a inspiring and heart-felt occasion. The retreat was organised by Palden Sakya, KBI's sister centre. Click here for retreat photos. and Passing into Mahaparinirvana. Proceedings began at 5:30am with the Taking of 8 Mahayana Precepts with Loppon and Lama Tsekyab. Our teacher Aenpo Kyabgon Rinpoche unfortunately was not available to preside over the auspicious gathering as he was unwell. As planned, a community vegetarian breakfast occurred around 8am. 3 years ago on 14/4/2010. Kyegu Monastery, our mother monastery, was also destroyed but is now being rebuilt. during the Black Saturday bush fire in Victoria and the floods in Queensland and northern NSW. at the centre also performed the puja. Many attended and provided the names of their loved ones to dedicate the puja to. Aenpo Kyabgon, and Rinpoche based the teaching on the Lojong text of "7 points in mind training". It was a terrific course that really inspired us all to practice giving love to others. Aenpo Kyabgon Rinpoche bestowed Arya Tara empowerment on Sunday 17 February 2013. The empowerment was followed by a community lunch. It was a terrific day. Thank you to all the people who turned up and made this event wonderful. Tibet before and after the tragedy. Click here for the artist's statement. Our annual retreat was held in November 2012 in the beautiful Megalong, Blue Mountains. Loppon Ngawang led the retreat and Lama Tenpa's company and culinary skills were enjoyed by all the retreatants. © Kyegu Buddhist Institute Inc.